We have a local wagtail couple that have produced 2 families in our jasmine bush, these past two seasons. 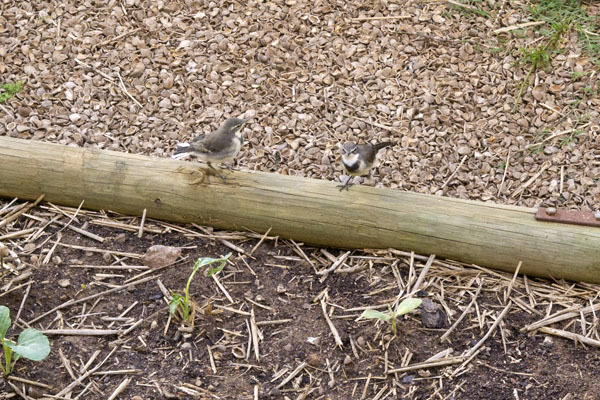 And I am happy to say that they have produced two new wagtails. I have been following their progress – from nest building to egg laying to hatchlings to fledglings. 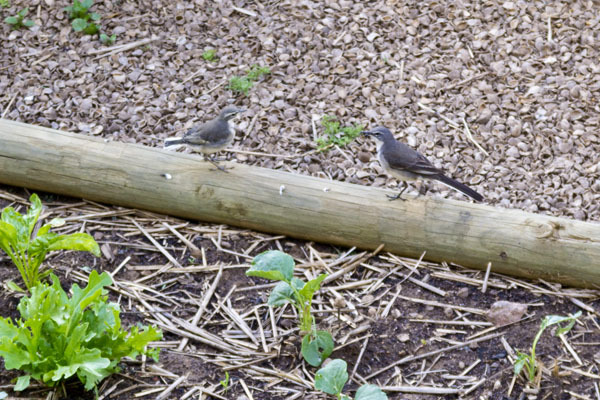 Now my new wagtail family enjoy my veggie patch and all the wonderful bugs that hang around there. Then on the 14th of October, I managed to get close enough to take a photo of Mommy Kwikkie on the nest. This is not a long lens either. She is ok with me working in the veggie patch, but I must watch my distance. In the other shot, I was literally 50cm away when I took this. They kept really low in the nest. I still could not see how many there were. I have a feeling there are only two babies! 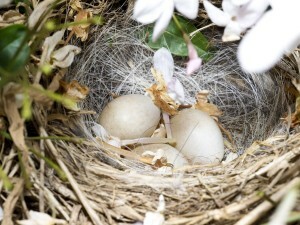 Baby birds in the nest! Cute! 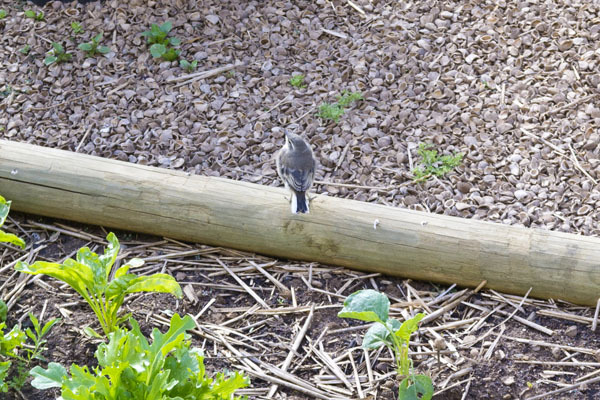 Then over the past weekend, I was amazed at the two new wagtail “kids” flying and cruising around the veggie patch. The parents seemed more flustered than the babies when I come around the corner with my camera. Here is the one baby – he sits and waits for mommy to feed him. The other one flies around and is more adventurous. Yup – here is the mommy making sure “Junior” is fed. 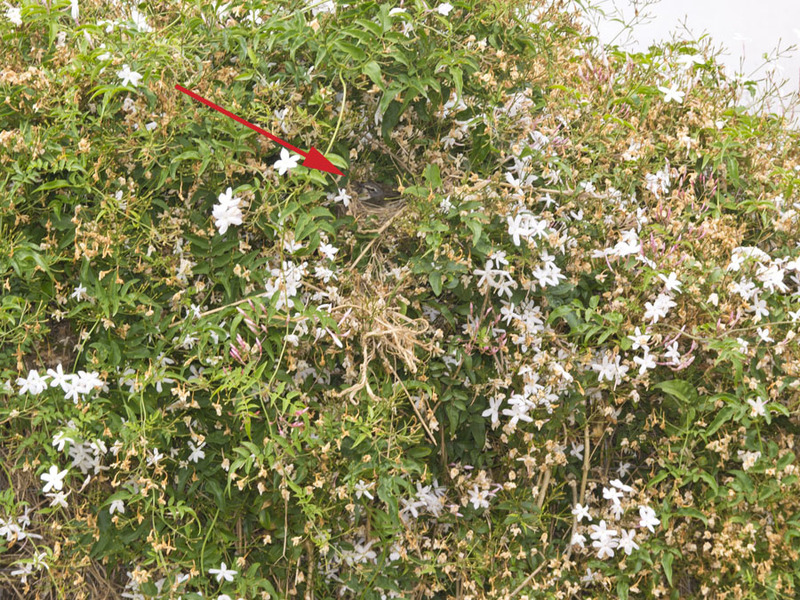 Can you spot all four wagtails? You can see the young ones have shorter tails! Well, soon they will be old enough to fend for themselves. I hope they all come back again. 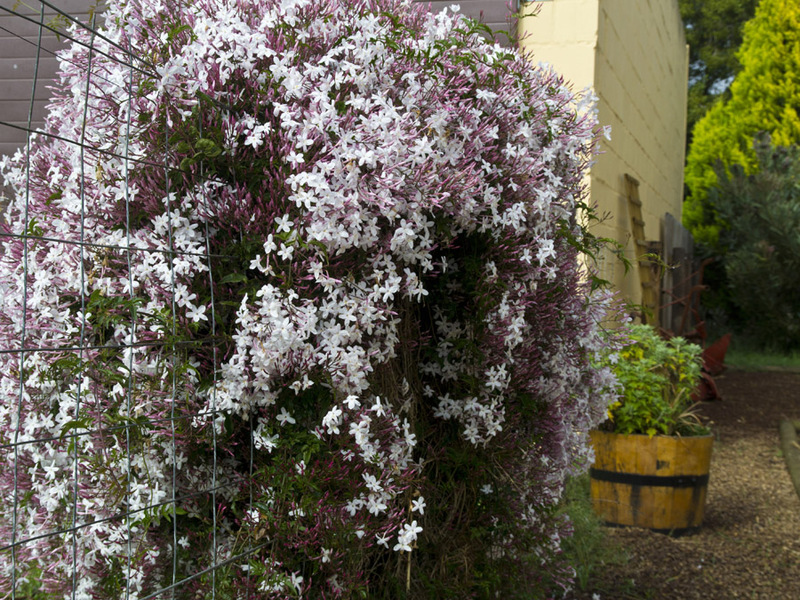 They are such a treat to have in the garden. They love all the miggies and bugs in the garden! Well, see you again soon – ! Your Wagtails are adorable! 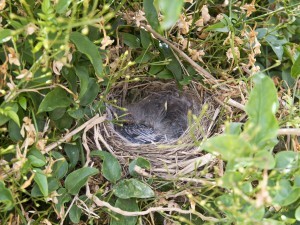 It’s always so much fun to see nests in the garden, then eggs, hatchlings, and if all goes well, fledglings. It took our poor flycatchers three tries before they finally had young survive until fledging. The nest failed last year after a predator stole the baby birds, and this spring, same again, but a second clutch this year was finally successful, and all three youngsters fledged. It was so gratifying to see. I hope your wagtails, and our flycatchers, return to nest again next season. 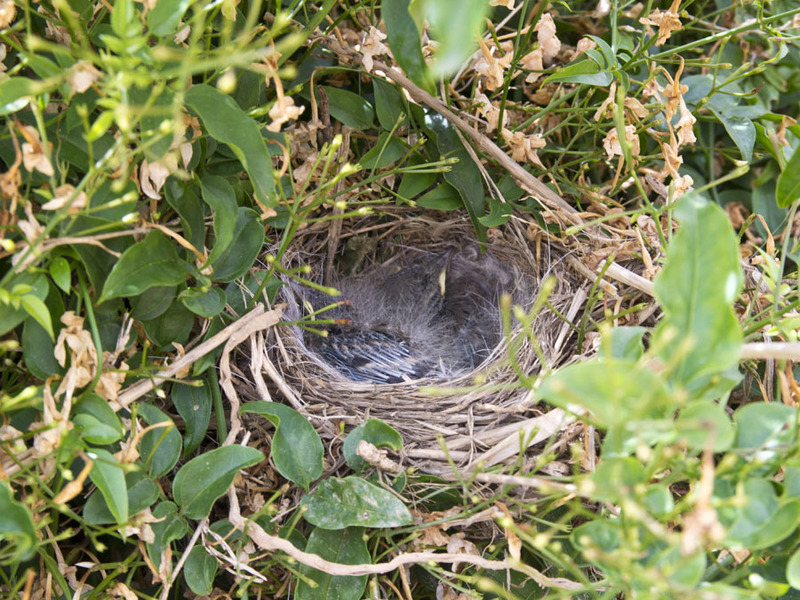 It is exciting to watch the progress of baby birds in the garden, but I am always so afraid that I will upset the parents or disturb the nest. Congratulations on being able to get so close. You must feel a bit like a proud parent, too! How fun!! Hopefully you will get to watch more generations grow up in your garden! How adorable! You may eventually have generations and generations calling your jasmine bush home! 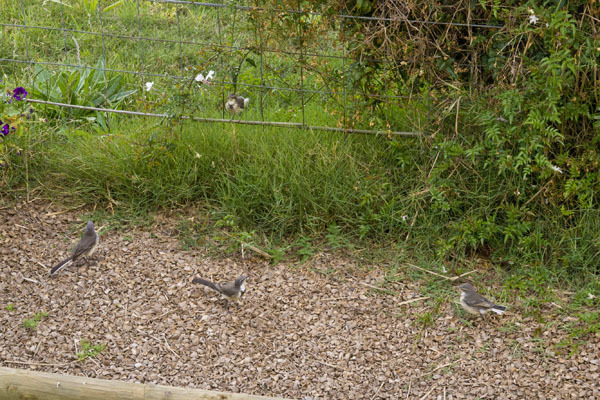 Wagtails, Kwikkie, miggies — Google translate is not helping! BTW, how is that nut shell mulch working out for you? I noticed it in a couple of the shots. What a joy it is to watch nature birth and grow! I share your enthusiasm for I, too, enjoy watching these creatures. Thanks for sharing the story and the photos…so cute!